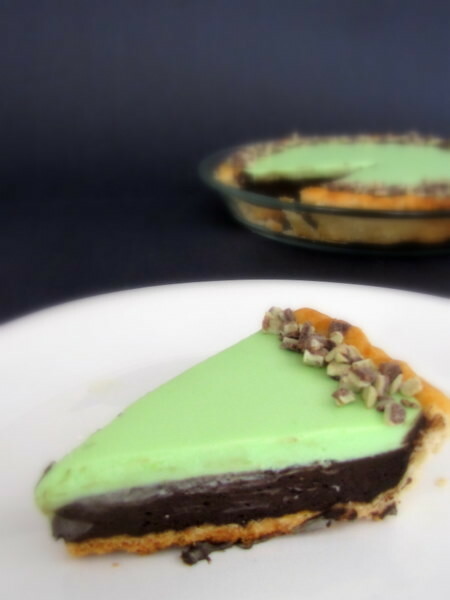 Chocolate and Mint Mousse Pie ~ I Can Do That! People will celebrate anything and today it's π day. I wonder when did people start baking a pi pie to sort of celebrate the day. I was really thinking of making a pie or cake so I can use the Andes® baking chips that I picked up from the grocery store last week. I can't remember the last time I had this mint chocolate candy, probably more than 10 years ago. It used to be a favorite but somehow I have been ignoring it until I saw the chips. And so to join all the geeks in honoring Pi Day and also the coming St. Patrick's Day (March 17), I made a chocolate and mint mousse pie. This light heavenly pie is easy to put together if you use a ready-to-bake pie shell. This recipe is adapted from Hershey's Chocolate Mint Mousse Pie. I added white chocolate chips to the mint topping. Dark chocolate mousse: Sprinkle gelatin over cold water in a shallow container and let stand for 2 minutes to soften. Add boiling water, stir until gelatin is completely dissolved and mixture is clear. Cool for 5 minutes. Stir together sugar and cocoa in the bowl of standing mixer with paddle attachment[ add whipping cream and vanilla. Beat on medium speed until stiff, scraping bottom of bowl occasionally. Add gelatin mixture; beat just until well blended. [Optional: Fold in half a cup of Andes Baking chips.] Pour into prepared pie crust. White chocolate mint mousse: Sprinkle gelatin over cold water in a shallow container and let stand for 2 minutes to soften. Add boiling water, stir until gelatin is completely dissolved and mixture is clear. Cool for 5 minutes. In the bowl of standing mixer with paddle attachment, beat together sugar, cream, melted white chocolate, green food dye, and mint extract to soft peaks. Add gelatin mixture and beat on low until well blended. Pour on top of chocolate mousse. Refrigerate for at least 2 hours. Finish pie: Garnish edges of pie with Andes® baking chips. Looks like you cook non-stop !